Stainless Steel sheets are typically manufactured using a continuous casting method: stainless steel is inserted between two cylinders turning in opposite directions to create thin sheets from 3 to 9 mm. To obtain thinner sheets, the material is then laminated with a method called cold rolling. Stainless Steel, contrary to regular steel, is an alloy that contains a larger amount of chromium that confers it a high corrosion resistance. Our Stainless Steel material is known as 304L, it contains 10% of nickel and 18% of chromium. The material has a brushed surface which is covered by a plastic film. This brushed finish is referred as GR220. The number 220 means that the abrasive which was used to brush the material contains 220 grains per cm². The back of the sheets are not brushed and are more sensible to scratches and stains but they are easily removable with a light abrasive. The price of manufacturing your design is calculated automatically the moment it is placed online. As you modify your object and utilize our optimization tools, you will note that the price changes automatically. The pricing is based on a series of factors, including: quantity of material used, labor, and machine manufacturing time - to name a few. 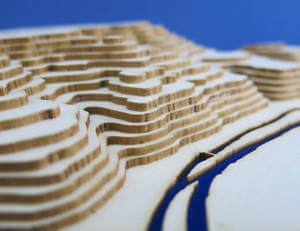 Laser Cutting is a digital subtractive fabrication technique that consists of cutting or engraving a material by means of a laser. 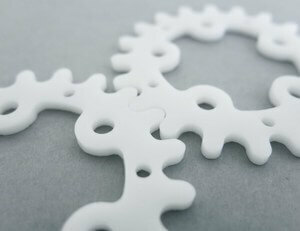 Laser Cutting can be used on a number of materials such as plastic, wood, cardboard, metals, etc. The process involves cutting material using a powerful and highly accurate laser that focuses on a small area of the material. The high power density results in rapid heating, melting and partial or complete vaporizing of the material. Usually, a computer directs the high-power laser at the material and traces the path. Laser Engraving (or Laser Etching) is a subtractive manufacturing method, that uses a laser beam to change the surface of an object. On metal, this process is not meant to be aesthetic: the design will be roughly engraved. It's typically used for serial numbers, references, or marks for later operations. To do so, the laser creates high heat that will vaporize the matter, thus exposing cavities that will form the final image. This method is quick, as the material is removed with each pulse of the laser. It can be use on almost any kind of metal, plastic, wood, leather or glass surface. Stainless Steel is a material that has several benefits, both on its ease of use and on its durability. The technical properties of the material can vary depending on the thickness but will stay quite stable regarding shrinkage and tolerance. Stainless Steel can be folded with appropriate equipment. Even after the cutting process, the material has a smooth finish surface. The main advantage of stainless steel, is that it doesn't need a rustproofing treatment. For these reasons, stainless steel is used in food industry, architecture, and surgery for example. To avoid scratches on the surface, it is better to avoid sharp edges and hard friction between stainless steel sheets. To protect the surface, we recommend using a clear lacquer or light oil on the surface. 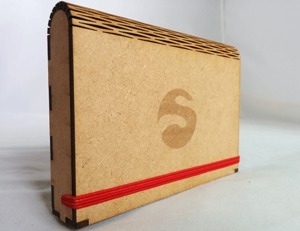 On the edges along the laser cutting path, the back is slightly sharp due to the cut. It can be removed with sanding paper. The back of the sheets are more sensible to scratches and stains but are easily removable with a light abrasive. The polished surface look is rather easy to maintain. To clean stainless steel, use water or mild soap with a cloth. Here is a close view of the surface of our stainless steel sheets. With Stainless Steel, just like for our other metals, we only do line cutting and line engraving, no surface engraving. The other difference between laser cutting metal and laser cutting other materials is that there is no need to take the kerf into account, since the laser cutting machine calculates the laser beam trajectory so the cut object corresponds exactly to the drawn design. You can design your part exactly in the dimensions that you want your final object to have. The laser will cut and line engrave your object with extreme precision. This has a consequence, however, which is that one line can’t separate two objects. It can only separate one object from the scraps of materials that won’t be used. So if you wish to laser cut two objects in metal, you can’t let them share one line, they’ll have to be designed as two separate objects. With metal laser cutting, it is not possible to have two lines that crosses each other in a same file. The other particularity of metal laser cutting is that during the cut initiation, the laser beam needs to perforate the metal sheet outside the ordered object, otherwise, it would leave fused metal projections on it. Because of that, it is necessary to leave a minimum distance between two lines of your design. Minimal dimensions are necessary for the laser cutting, but not for engraving. Indeed, if the surface is too small, it could be lost under the cutting table's grid. If you wish to keep only the outer surface, this constraint does not apply. Keep in mind, however, that laser engraving for metal is not meant to be aesthetic. Your text will be roughly engraved - it's typically used for serial numbers and references. For laser cutting , it is key to take the minimum distance between two lines into account in order to obtain a proper laser cut. However, be careful to respect a minimum distance between two lines, that is equivalent to the thickness of the material. Contrary to cardboard, acrylic and MDF materials, with metal laser cutting, you will receive no "order frame" (on the image above, the order frame would be the black rectangle). In fact, offcuts are used to initiate the laser cut, and are scarred by fused metal projections (the laser beam will always start to cut a closed path outside of the object). For example, in the image above, if the uploaded file only contains the blue and yellow drawings, the customer will only receive the stars, the disks and the rectangles. If the file contains the outer black square, the customer will receive a square with star-shaped, rectangular and circular holes! Be very careful to keep this in mind when creating your design.